Past test, keys, and photos are available to download here. Science Olympiad’s earth science event focuses on the interpretation and understanding of geological features and processes from geologic and topographic maps. The event — referred to simply as “Geologic Mapping” in official Science Olympiad rules, competitions, and resources — will run for three competition seasons (2013-2016) as an event for 9th through 12th grade students. UTIG supports the event by writing several exams used around Texas, as well as the national rules which proctor the event. 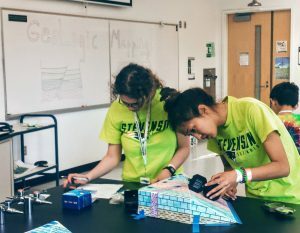 Science Olympiad’s planetary science event focuses on the observation and understanding of features and processes relating to extraterrestrial ice and water in the solar system. The event — referred to simply as “Solar System” in official Science Olympiad rules, competitions, and resources — ran for two competition seasons (2013-2015) as an event for 6th through 9th grade students. The event was sponsored by UTIG. While the event is discontinued there is hope it will come back in the near future. The Solar System event tests students on their ability to “demonstrate an understanding and knowledge of the properties and evolution of extraterrestrial ice and water in the solar system.” It focuses on specific targets that include, but are not limited to: Mars (polar ice caps, equatorial glaciers, permafrost), Europa (Thrace Macula, Thera Macula, Conamara Chaos, ridges, cycloids, plains, ocean, plumes), Enceladus (plumes, tiger stripes), Iapetus, Triton, Ceres, Titan, comets, the Kuiper Belt, and the Oort Cloud.